When you think of Thailand and all the wonders that it holds one of the thing’s that pops into mind is the magnificent Elephants. All over the internet you see pictures of people riding them in exotic locations with joy in their faces! What you don’t see in these images is the joy in the elephants faces. The ethical treatment of the elephants is a hot topic in the world of elephant tourism. When you walk around Chiang Mai you come across countless tourism offices that depict these images of happy tourists riding the elephants. 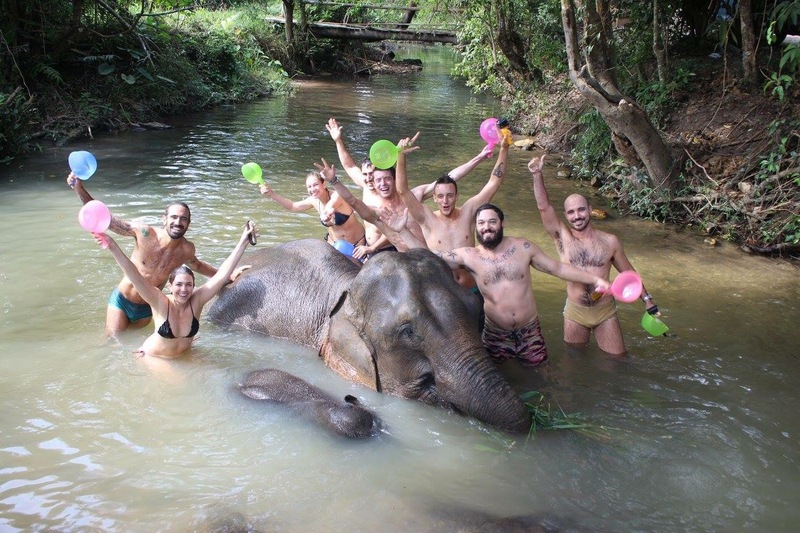 While you can opt to go on one of these tours I would like to offer an alternative option that brings joy to not only you but the elephants as well. You probably have heard it before from countless blogs and people around the internet say DON’T RIDE THE ELEPHANTS but don’t really explain much to persuade you not to other than put it in all caps. So I would like to offer you a look into a day at an elephant sanctuary called Doi Inthanon Elephant Park. At this park there are several options to choose from on what to do but I will just cover the option I did. 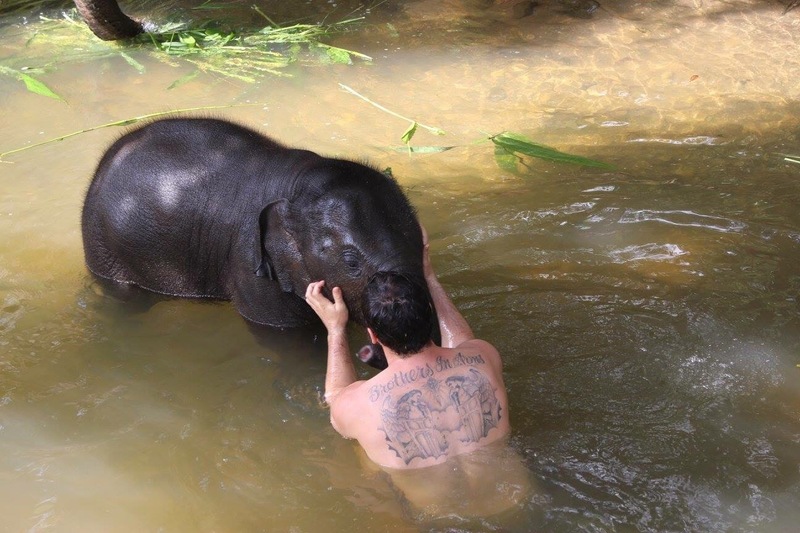 The Full Day Elephant Care that was from 0800-1700 and cost 2,400 Baht per person. You are picked up in an air conditioned van by your guide and a driver. Now just to let you know my buddy did the same tour but with a different company but he was picked up in a converted open air pickup truck packed in like sardines for the hour ride in the mountain. It did not look like fun. I was pleased with my ride needless to say. So they pick you up and you head out of the city toward the mountains. About 30 minutes or so into the ride you stop and a small town with an outdoor market for about twenty minutes so you can grab any snacks and to stretch out your legs. I decided to take this opportunity to explore the local market and sample some food. 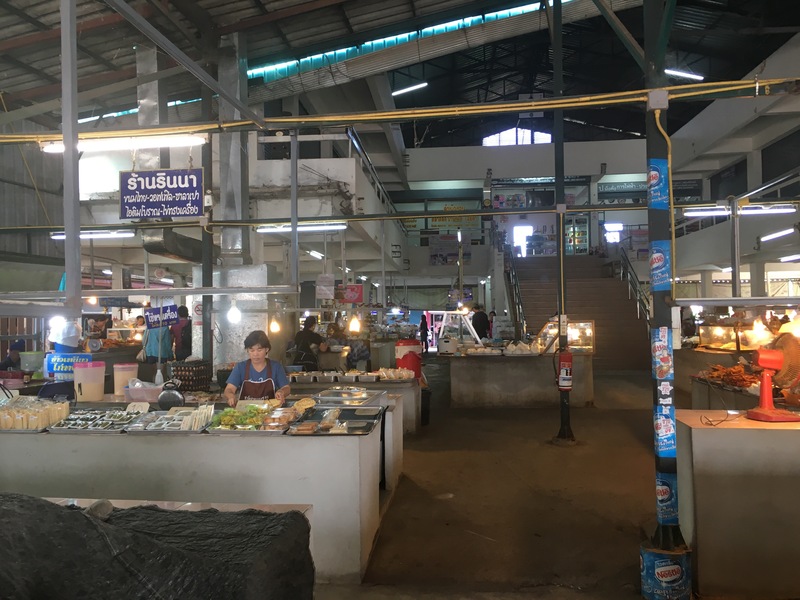 I found the market to be a condensed down version of what you find in Chiang Mai so I sampled some food while we waited. The sausage we had was kinda sweet like fruity pebbles mixed with a beefy flavor..quite strange!? The guide we had called himself Thong Cruise like Tom Cruise but only more handsome! He was a funny guy. He spoke pretty good English and we came to find out that he learned it all from YouTube!!!! That is quite impressive! He explained to us that he is from the hill tribe and not Thai. The people in the hills are composed of two tribes: long necks and short necks. He said “he is short neck”. You continue on the ride into the mountains which gets quite curvy so if you get car sick bring some Dramamine. The views though are amazing and you will see some cool things along the way but what you will see in the lower parts of the Doi Inthanon Nation Park is the company’s that do elephant rides. They line the side of the roads with packs of tourist eager to climb aboard. Once you pass these you come to a turn off and you go down a dirt road to a dead-end that has a small river and bamboo bridge. This is where your adventure begins. Here you are escorted to covered bamboo sitting area overlooking the entire park. Here you will change into a traditional shirt of the hill tribes. There are two types based on color. One for the ladies and one for the guys. Thong Cruise says “you pick shirt and I’ll tell you if it’s for lady or boy after you have it on”. You guessed it. I was wearing the ladies shirt! So here I am wearing a Thai ladies shirt for the day! she seemed to be amused that I was wearing a ladies shirt! So he starts handing out satchels that will hold the fruit and here come a baby elephant out of nowhere running up putting her trunk into the satchels looking for food! It was the darndest thing! You instantly got all the awes from the group! Tang had to shush her away like a little puppy well a 250 lbs puppy! He fill out our satchels with fruit and other foods they like and we head out towards the edge of the jungle to meet the elephants. Once you are there you are surrounded by the elephants and you just go to town hand feeding them as much as you want and they don’t seem to mind at all! Hand feeding the Mama Elephant! So you walk up to the elephants and say “Bon Bon” and they open they know it means food so they’ll open their mouths for you to stick it in. Sometimes they will grab the food with their trunk as well. Which remind’s me to warn you about the baby’s they will sneak up on you and stick their trunk into your satchel and steal food out! Tang says they can be naughty like that if you don’t watch out! After about and hour to hour and a half you will run out of food because each of the elephants eats around 200 kilo’s of food per day! About this time the Thai police inspectors were finishing up and we were free to go on our jungle hike with the elephants. 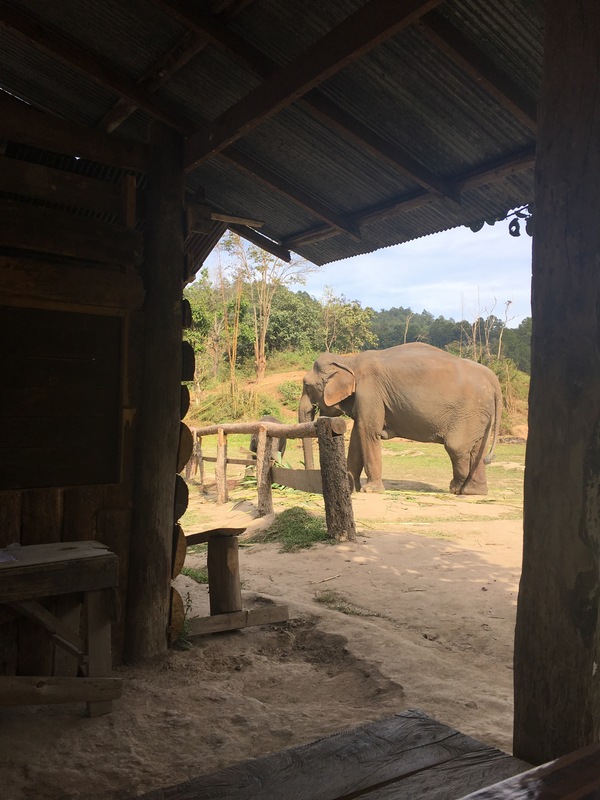 Tang explained to me that the inspectors come out to make sure they are being cared for properly and that the proper amount of food is available and living conditions are adequate for the ten elephants that live here. This is to insure that people are abusing and mistreating them. So after the feeding is done you set off up into the jungle. Apparently, they need a little exercise after eating all that food! So my small group sets off with two of the caretakers in tow. The caretakers make sure the elephants don’t crush us if we slip and fall in front of one! The journey up the side of the mountain can get a little tricky at times because the elephants are so big and heavy that the ground can get torn up a bit but they traverse it like its nothing! I was surprised how agile and athletic such large creatures could be! We climbed a higher up into the mountain and when you looked out you realized why you came to Thailand. Where else could you climb up a mountain side with elephants and interact with them in their natural element completely on their own accord. It felt more natural than riding on top of one laden down with pads and riding platform’s. This was the way the elephants were supposed to live. They were free to do as they pleased and be themselves not for some tourists to sit atop and ride around. After about an hour of interacting and walking alongside the elephants you will head back down the mountain. This part of the trip is quite amazing. I couldn’t get over being able to interact with them on a mountain top in a national forest in their natural habitat. Just seeing how happy they were (which you can totally see on their faces!) was worth every penny! What a view for lunch!! At lunch time you get a nice spread of homemade food that included chicken and vegetable curry with rice and some fruit. While the lunch was great the best part was the view while you were eating. Sitting there with the elephants eating next to you was incredible but what was even more entertaining was when the baby elephant sneaked by the caretaker and ran up to our table! She was a crafty little one and was trying to get some of the crushed pumpkins that were next to us! It was quite exhilarating to hear a noise and look back to see a baby elephant running right at you! This is something you definitely would not experience riding the elephants around! Another good reason why you shouldn’t ride them as if there weren’t enough already at this point! 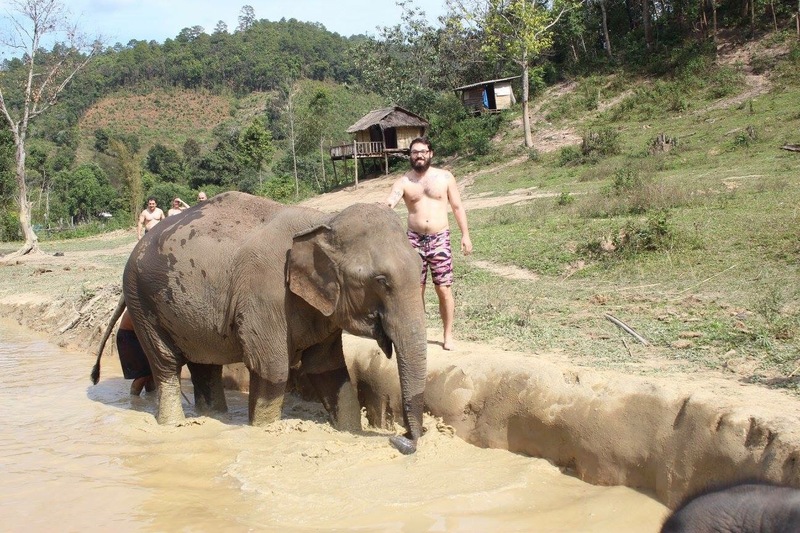 Mud Bath with the Elephants! Yes I know I’m really white! The time has come for what everyone takes this tours for and that’s the playtime with the elephants! The water kinda cold but the mud was about knee-deep! The elephants dove right in and you could see the smiles on their faces as they rolled around in it cooling off! We all kinda kept our distance from them in the mud because if they rolled over we couldn’t go anywhere as we were kinda stuck in place. The caretakers told us to help them out and throw mud on them and rub it all in. So as this is happening somehow a mud fight broke out between us and the elephants. No idea who one that all I can say is I think we all one! While this was quite fun the mud party was over and it was time to move to the grand finale! As we walked down to the river you are surrounded by the elephants who just walk right there with you. It was quite remarkable. They knew where to step and how to move among you without crushing you. I was in awe of their grace and beauty even though they were covered in mud! When we got to the river bank there was a steep climb down and going down that with two elephants was intense. I for sure though one of us was going to be crushed by one of the elephants! We all made it down with and were given brushes and hand scoops for water so we could wash and bath the elephants. Well obviously this called for an impromptu photo! This part of the trip was the best part of the whole thing! 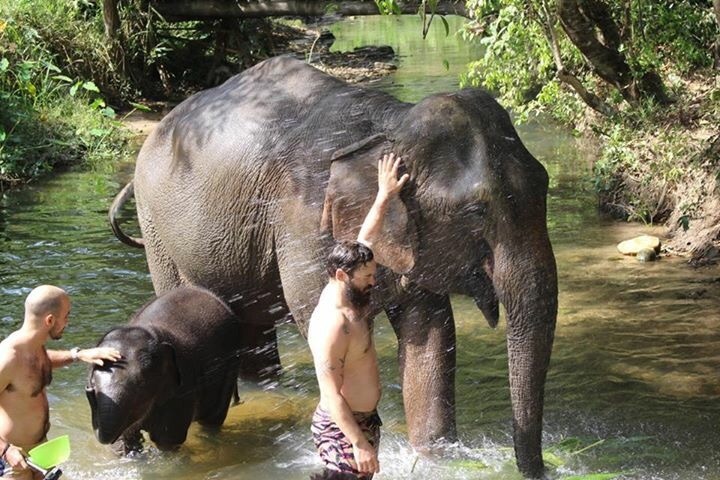 Hanging out and having water fights with the elephants is awesome! Never in a million years would I have thought that I would be chilling with an elephant in a river! She just shot water from her trunk in my face! Standing there one on one looking in the eye of an elephant you can really feel the connection. It is something out of a story but in real life. It is hard to explain but it is something I would have never experience if I was riding on top of one. While all the commotion was going on I stepped aside for a second to take all this in and that’s when the most incredible thing happened. The baby elephant came up to me one on one away from everyone else and just looked into my eyes and hung out with me. The baby and I sharing a moment. This was absolutely priceless. Something I will never forget! This alone should be enough to convince anyone not to ride elephants! How could you possible experience one on one time with a 9 month old baby elephant under any other circumstance. Those few minutes with the baby was something magical that everyone should experience in their lives. If there is only one thing I could say to convince you to visit a sanctuary this would be it! I just have to thank Thong Cruise for capturing this epic moment for me. So the bathing ends and you walk up to dry off. You have around thirty minutes to hangout and change into dry clothes before you head back to your hotels. However, most of us took this time to hang out with the elephants some more while they ate. So I will leave you with a few parting pictures of the end of the day. I hope this article dissuades you from riding the elephants and shows you the joys that can be had by spending the day interacting with them versus sitting on top of one. It takes a group effort to show that sustainable and ethical tourism is here to stay and can be just as profitable for companies to move in this direction. So please help by sharing this post with your friends and family who are considering riding elephants or just like them because I know I sure do! If you are wanting information about this specific park that I spent my time at you can find them on facebook and on their website where you can book tours. Also, if you are interested in Thong Cruise he is the man and will give you a discount if you tell him the roving backpacker sent you! Be sure to gear up properly for your trip and check out my travel gear list of what to bring on your trips abroad! Comment below with any question or comments! PLEASE BE SURE TO LIKE AND SHARE!!! !